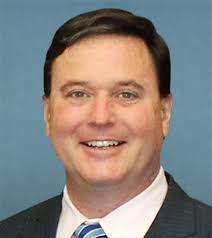 INDIANAPOLIS -- The two men who ran the Trump-Pence Indiana 2016 campaign endorsed Rep. Todd Rokita, R-4th, on Monday in the Republican U.S. Senate primary. Rex Early and Tony Samuel offered their personal support for Rokita, who is running against Rep. Luke Messer, R-6th, and businessman Mike Braun. "Congressman Rokita was on board when it counted," Samuel said of Rokita's support for Trump when others were criticizing Trump or distancing themselves from him during the 2016 race. Samuel emphasized the endorsement is not from President Trump or the White House. "(Todd Rokita) is a fighter and President Trump needs a fighter," Early said. Both men said Messer now supports Trump but in 2016 -- even after the nomination was sewn up -- Messer took shots at him. They said Braun was missing altogether and didn't donate to Trump or Republicans. The winner of the primary faces Democrat U.S. Sen. Joe Donnelly in the fall.